Nightwatch blog began shortly before Obama was elected president of the United States. It was not my original intent to blog about politics or Obama or the question of his eligibility to be president. I actually expected the issue to be resolved years ago. I am astounding that such an important constitutional question still has not been heard in the courts of America; in fact they seem to be ducking the question and running for cover. The questions of his eligibility seem legitimate and loom large over our nation. Are we still a nation of law or have we chosen another path? The questions regarding Obama’s eligibility originate directly from the U.S. Constitution. Article 2, Section 1, states that only a “natural born” citizen may be eligible to be President of the United States, and dual citizenship is not allowed. Obama’s eligibility is questionable on several accounts. Some of the major ones are listed below, plus there are over 200 articles and links on this blog that can be read and studied. 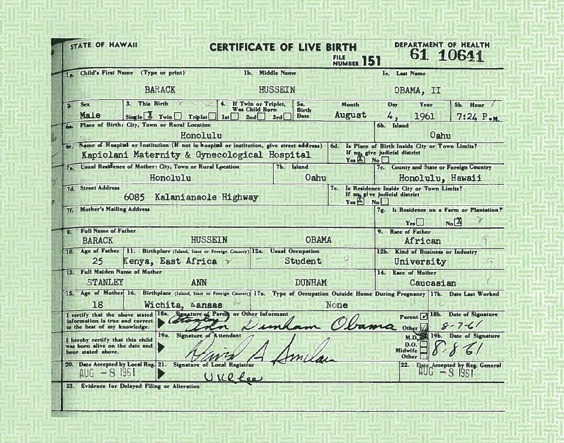 Obama is not a “natural born” citizen because his father, according to Obama, was a British subject from Kenya. A “natural born” citizen must have two U.S. citizen parents. In addition, since his father was British, Obama at best was a dual citizen, which is also not allowed. 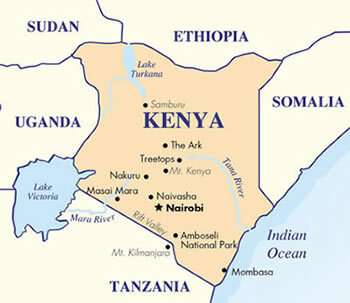 According to Obama’s own grandmother who lives in Kenya, she attended Obama’s birth — in Kenya. She claimed he was not born in Hawaii but in Kenya in Mombasa. 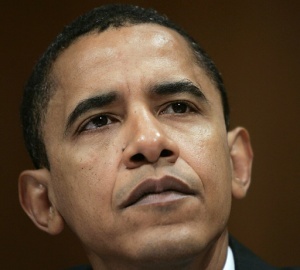 The African press has stated on more than one occasion that Obama is a Kenyan, African-born. 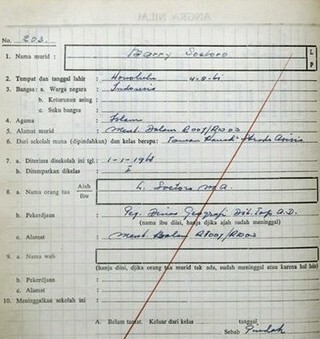 Obama’s mother remarried an Indonesian man and the family moved to Indonesia where Obama attended school under the name Barry Soetoro, indicating his stepfather adopted him. Also, only Indonesian Muslims could attend school, so Obama must have taken Indonesian citizenship as well, meaning he was no longer an American citizen. During his time in college it is known that Obama traveled to Pakistan; however, the year he went there American travel to Pakistan was prohibited because of international conflicts, so the only way he could have gotten into the country was on a foreign passport — perhaps an Indonesian passport. 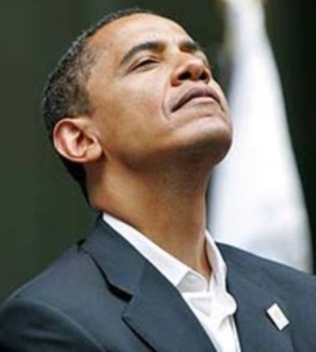 Obama intentionally sealed all of his college and university records, without explanation, so it is impossible to see if he registered as an American student or a foreign student, like his father. Very few records are available about any facet of his life. He has spent an estimated $2 million so far to keep his records secret from the public. 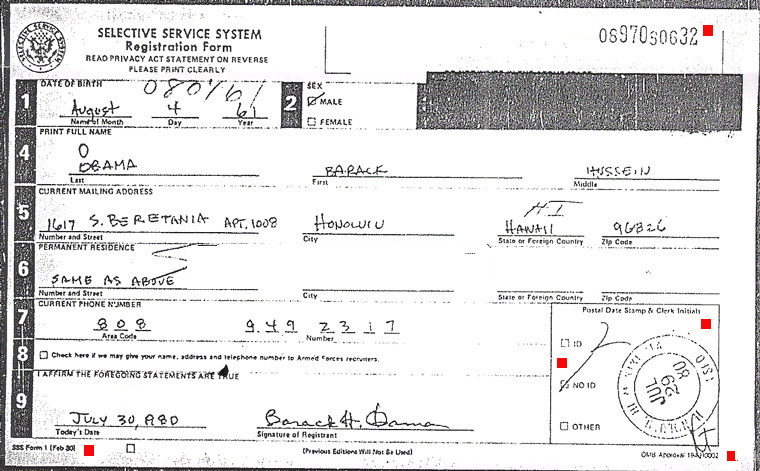 Obama briefly posted his Selective Service card, but anomalies with the card and the year it was supposedly issued (red squares) were noted and it quickly disappeared from the internet. A Certification of Live Birth was then posted on the internet, but it also came under scrutiny, especially when it was learned that they could be obtained simply on request. Complicating the issue was the fact that neither of the hospitals in Hawaii where Obama claimed to be born (yes, he’s claimed two different ones) have any record that he or his mother were ever in the hospitals. Oddly, no doctor, nurse, or hospital worker has ever come forth claiming they attended Obama’s birth in Hawaii though monetary rewards were offered if someone would prove they attended his birth or saw him in the hospital as a newborn. 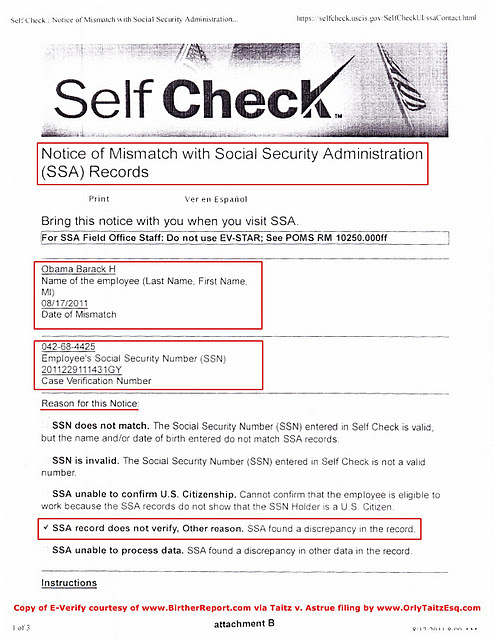 A search of government records showed that Obama’s Social Security card and number were issued in Connecticut, a state Obama never lived in. SS numbers are coded by the state that issues the card. Further search found that the number Obama is using was never issued to him. However, a judge dismissed this because he felt the information was obtained without good faith and the person who accessed it had no legal reason to do so — though it came from the SS administration’s own site. 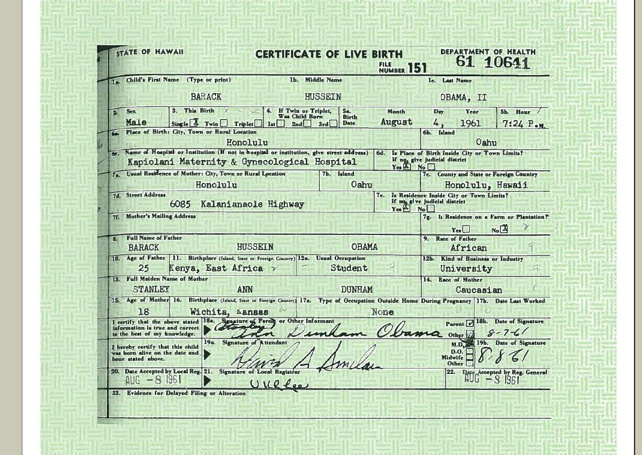 Finally, there is the whole controversy involving the posting of what purported to be Obama’s “official” birth certificate a full two plus years after he took office. However, it took the computer savvy less than an hour to determine that the “certificate” was actually photoshopped and likely fraudulent. 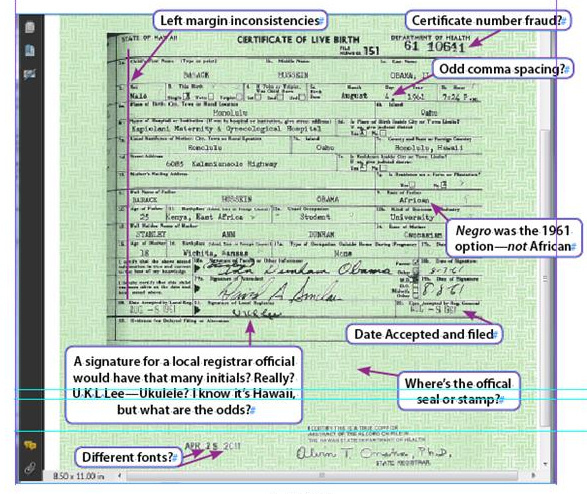 Subsequently, several document, typographical, software, and computer experts have examined the certificate and have largely labeled it a forgery — and not a very good one. 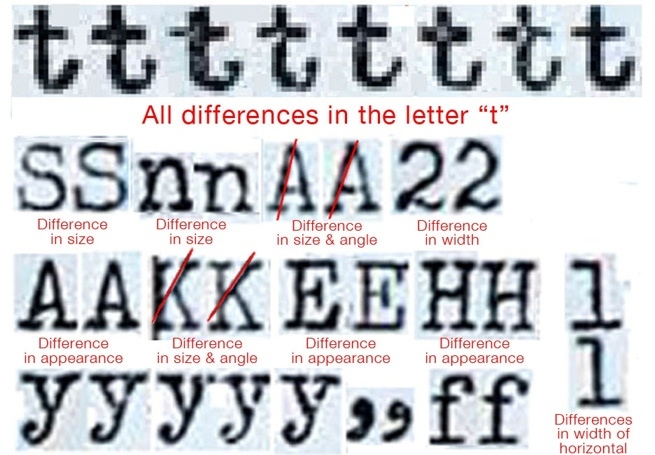 The list of anomalies is long, but some are very telling, such as having different typefaces (which a typewritten document from 1961 would not have). One expert went so far as to figure out exactly how the forgery was made and then recreated the “certificate” to prove it was forgery. All of these stories and links to other articles and pictures of the documents in question are in the previous postings on this blog going back to fall of 2008. As I said, over 200. However, I am being called in another direction now and I will not be adding anymore to this blog unless and until this matter is finally resolved or something very major breaks. Then there might be one last big story — if some court or the Supreme Court will finally agree to hear the case of Obama’s eligibility under the U.S. Constitution to be president and allow the evidence to be shown. Right before Christmas, the Ninth Circuit Court of Appeals in San Francisco finally released its ruling on the lawsuits challenging Obama’s eligibility to be president under the requirements of the U.S. Constitution. The Court dismissed the cases and refused discovery basically saying that whereas the plantiffs might have “competitive standing” to sue, Obama’s inauguration wiped out any claims the plaintiffs had about the election being unfair. In other words, this ruling means that once he took office, it’s too late to challenge the election whether there was fraud or not. The plaintiffs in these cases included two 2008 presidential candidates, Alan Keyes and Gail Lightfoot, and one vice presidential candidate, Wiley S. Drake, plus other officials and interested parties. The judges stated in their surprising opinion that once Obama was sworn in the plaintiffs were no longer candidates, therefore their claims to an unfair election disappeared with the administration of the oath of office since the lawsuit was filed hours later, meaning too late. Currently, the attorneys for the plaintiffs are weighing their next move, though attorney Orly Taitz has vowed to fight on until all avenues are exhausted and justice is done. 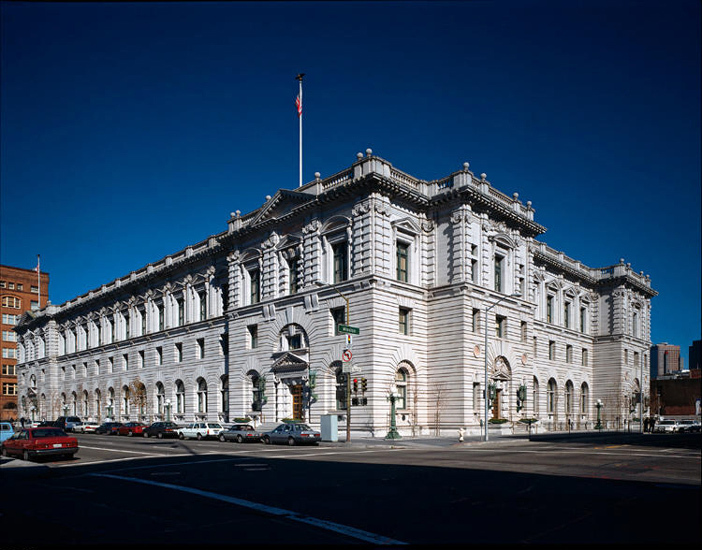 So far no court in the country has agreed to hear the case on its merits and most have dismissed the dozens of cases brought forth on various technicalities, usually on the question of standing, though the Ninth Circuit may have put a crack in that claim. 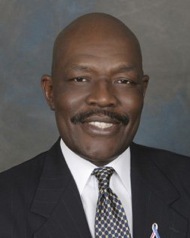 It is well known that Obama’s father was a British subject from Kenya and that the U.S. Contitution does not allow dual citizenship for the office of president. A president must be a “natural born” citizen meaning both parents must be U.S. citizens. Sooner or later the Court will have to rule on the constitutionality of Obama’s presidency, hopefully before the next election.